The Bristol Ensemble’s popular series of tea-time concerts at Christ Church, Nailsworth, continues with a recital of oboe quartets. 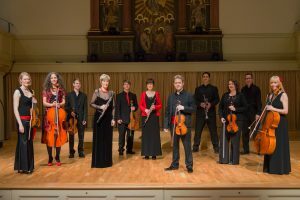 As part of the Bristol Ensemble’s Notes for Women series, the recital includes Marie Grandval’s Romance, Scherzo and Gavotte for oboe and strings. Throughout the year marking the 100th anniversary of women being given the vote in Great Britain, the Bristol Ensemble is programming works by female composers in its concerts, and is giving a series of three concerts at St George’s Bristol devoted solely to music by women. The first of these takes place on 28 April, exploring music from plainsong to the Baroque.